What is the Far Cry 5 Game? Far Cry 5 is an action-adventure first-person shooter (FPS) video game developed by Ubisoft Montreal and Ubisoft Toronto and published by Ubisoft, which is supported on Microsoft Windows, PlayStation 4 and Xbox One platforms. It is based on standalone video game Far Cry 4. The Far Cry 5 game was released in 2018. What Can You Spend Far Cry 5 Credits On? Maybe players care about What exactly are Far Cry 5 Credits used for? Well, Far Cry 5 Credits are the game currencies, which can be purchased weapons, Perk Points, Crafting Materials, Clothes, and Vehicles in-game. Pretty much anything you’d need to use in the game. What are Far Cry 5 Silver Bars and How to Get Far Cry 5 Silver Bars? Far Cry 5 Silver Bars are a collectable in Far Cry 5. They act as a premium currency, allowing players to buy various cosmetic items for character in-game. Far Cry 5 Silver Bars can also be used to buy prestige weapons, vehicles and skins. 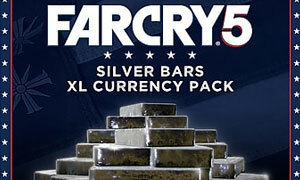 If the balance of Silver Bars is insufficient, you can Buy Far Cry 5 Silver Bars Pack from Joymmo.com's online store. Just enjoy the Far Cry 5 on Microsoft Windows, PlayStation 4, and Xbox One devices.